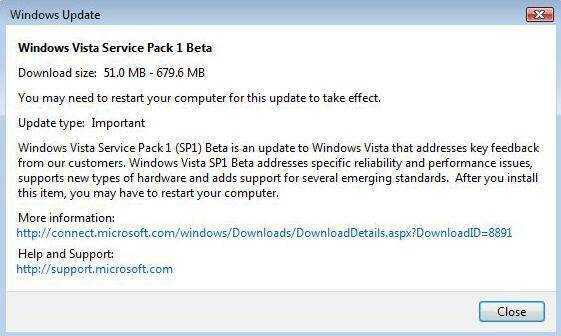 Microsoft has released Windows Vista SP1 (Service Pack 1) beta v.275 with build version 6001.16659.070916-1443 to selected beta testers since late September. If you eager to try and want to have a taste of running Windows Vista system after installing SP1, here’s trick of a legal way to download the service pack directly from official Microsoft Windows Update site, shared by zzdiesel. To download Windows Vista Service Pack 1 (SP1) from Windows Update, a few registry keys need to be added to the registry so that Windows Update will recognize the Windows Vista machine as a valid SP1 roll out target. Copy and paste the code below into a text editor (Notepad is good), and then save the file as a batch command file with a name such as SP1Beta_Hack.cmd or SP1BetaRK_ext.cmd. For your convenient, download the file here (no longer available). echo Windows Vista SP1 Beta registry key has been set. Apply and merge the new registry keys and values to the Windows Vista registry by running the saved command file with administrative privileges (right click and choose “Run as Administrator”). Once the registry keys are added, run Windows Update and check for any new updates. You have to install up to 3 additional updates as below. These three updates may or may not be offered to your system in Windows Update, and only one update can be installed at a time in the following sequence, i.e. after installing the first update of KB935509, you have to run Windows Update and check for updates again to see KB937287, and likewise for KB938371. Restart the computer after applying above 3 hotfixes. Run Windows Update again to check for any important updates offering, which will be the SP1 for Windows Vista beta. Note that Windows Update may take some time before eventually identify the registry added system as SP1 beta delivery target. Continue to try to check for updates for a few times, and, once your system is recognized as valid target, you should see 1 important update with size ranging from 51.0 MB to 679.6 MB in the WU listing as shown in screenshot below. If you click on “View Available Updates” link, the name of the updates will be shown, that is Windows Vista Service Pack 1 Beta. Right click on Windows Vista Service Pack 1 Beta and choose to View Details of it will show description on the service pack and more information link at Connect site (dead link). Note that SP1 beta is currently only available in English, German, Japanese, French and Spanish languages. If the Windows Vista edition installed on your system is in any other language, Windows Update will not offer you Windows Vista SP1 Beta. Beside, if you build your own Windows Vista DVD with vLite, you probably out of luck too. It’s reported that only Windows Vista installed with unmodified original retail or OEM DVD disc/image will be able to see SP1 in WU site. Final note is that SP1 for Windows Vista is currently in beta, and beta version mean it’s prone to bugs, unstable, and will likely cause you more problems than solve any problems. So download and install SP1 only for evaluation purpose. The beta version will expire in June 2008.